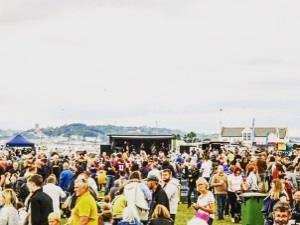 Beaumaris Food Festival is set in a stunning seafront location between the historic Beaumaris Castle and the Menai Straits with the picturesque Snowdonia Mountain range providing the perfect backdrop, we cant think of a better location that encapsulates the very essence of Wales’ 2019 theme ‘The Year of Discovery’ . As always this hugely popular event promises to be a wonderful weekend filled with food, drink and entertainment. There will be over 100 exhibitors, ensuring that there is something for everyone,and with Local, National and International Food producers in attendance you’ll be sure to discover a taste of Wales and beyond! In addition to the abundance of food, drink and craft stands, there will be quality entertainment including live music acts on stage throughout the day, talk tents hosting guest speakers talking about a range of things from Anglesey’s nature hotspots, sustainability and welsh tales and culture, there will be children’s entertainment and a marquee dedicated to superb chef demonstrations from local, celebrity and Michelin star chefs. More to be announced soon! Admission is £5 per adult or £7 for both days, accompainied children go free. There is free parking for festival goers a short walk away, with free park and ride also available.